Very positive: the presenter sent us special materials after the course, which we briefly mentioned in the course. That’s what I call customer focus!! For centuries, thousands of the brightest sailors, mathematicians, astronomers, physicists, artisans, watchmakers, precision mechanics, pilots, etc., have puzzled over the riddle of positioning on the high seas. And they not just solved it! NO – they have improved the procedures so much that today every person is able to work out relatively accurate position information within a few minutes. Completely without sophisticated calculations, for which a math study would be helpful. So astro navigation is really fun! During our compressed SMA AstroCompact course you will learn the sensible, practice-oriented and seamless integration of modern and astro navigation with the sun – in one day! Optimized for use on board a yacht, with simple means and in comprehensible steps. At the end of this SMA AstroCompact you will be able to calculate and draw accurate position lines – ship locations with the stars. Nostalgia? Also … Astronavigation connects us with our nautical ancestors and it is a very satisfying feeling to do it “without electronics”! But above all, the navigation with the sun is exciting, helpful – and ingenious! Absolutely no knowledge of trigonometry and logarithms required! This course is mostly conducted in German. 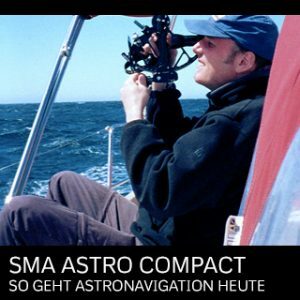 SMA Astro Compact is NOT a course according to RYA scheme – the certification is carried out by the Swiss Maritime Academy.